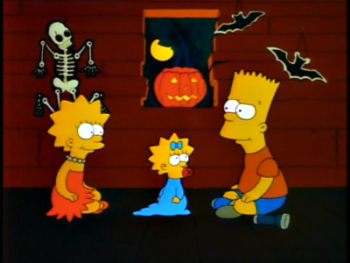 ‘The Simpson’s’ is coming up on its 24th season, which means that the famous Halloween special we have all come to love, ‘Treehouse of Horror’ will be returning. This will mark the 23rd Halloween episode for the series. The episode will air Sunday, October 7th according to TVline. So set your recording devices to see demonic posession, Black Holes, time travel, and the end of the world in the upcoming ‘Treehouse of Horror’ episode. 2nd segment: “…a found-footage parody” – in the vein of Paranormal Activity – “where something really strange is going on in the Simpson house,” the showrunner adds. I can totally see the end of the world being Homer’s fault. This entry was posted on Sunday, August 26th, 2012 at 10:39 am	and is filed under News, Television. You can follow any responses to this entry through the RSS 2.0 feed. You can skip to the end and leave a response. Pinging is currently not allowed. « Geek Deal of the Day!!! ‘Walking Dead’ Blurays!! 61% Off!!! "I’ve kissed a guy... I’ve kissed guys. I just haven’t felt that thing.... That thing... that moment when you kiss someone and everything around you becomes hazy, and the only thing in focus is you and this person. And you realize that that person is the only person you’re supposed to kiss for the rest of your life. And for one moment you get this amazing gift. And you wanna laugh and you wanna cry, ‘cause you feel so lucky that you’ve found it, and so scared that it’ll go away all at the same time."